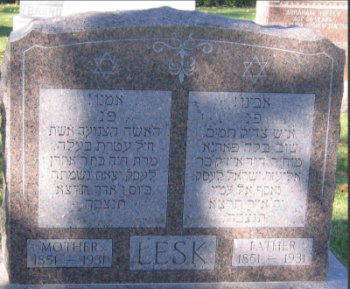 David Lesk – A Pioneer Rabbi in America. David Lesk was born in Shveksne, Kovno (now Lithuania), in 1851. He studied for the Rabbinate and received received his final certificate from the Rabbi of Krotingen, Kovno. Chayeh Prisman, David’s bride-to-be was born in Krotingen. In those days, weddings were arranged by the respective parents, or through the services of a “shadchan” or professional matchmaker, and as both David and Chayeh descended from a long line of Talmudic scholars and were equal in social status, their marriage was consummated without objection. In the ensuing years Chayeh gave birth to four children, three girls named Ella, Celia, and Bertha, and a son named Baruch, subsequently known as Benjamin or Ben. With four extra mouths to feed, David found it difficult to survive on his meager income. In addition, Jewish pogroms were not uncommon, and there was the ever present danger of being conscripted in the Russian army. David had a sister living in Kansas City, and his thoughts’ turned toward America— the “goldene medina”. In due time his fare for the trip was arranged, and he departed for England in 1887, leaving behind Chayeh and the four children. 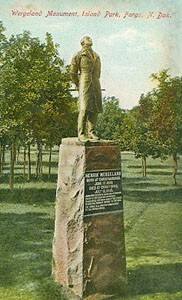 After staying in England for 3 years he left for America and reached Kansas City where his sister resided. Shortly after his arrival he accepted the position as Rabbi in Wichita, Kansas, and later moved to Topeka, Kansas to accept a similar position there. He stayed there for a comparatively short time until he learned that Fargo, North Dakota, a town with about 8000 in population and ten Jewish families, was looking for a Rabbi. He applied for the position and was accepted with a guaranteed income of $25.00 per month. For the time being, he was the only Rabbi in the state, being subsequently joined by Rabbi Papermaster of Grand Forks. He traveled as much as 300 miles to perform a circumcision. By performing sundry rituals he was able to augment his income somewhat, and help to support his family in Lithuania. However, the amounts he was able to contribute were barely enough to support Chayeh and the children, and she was forced, to find odd jobs. However being a “Rebbetzin” she undoubtedly received special treatment. The years rolled by, and in 1895, about five years had elapsed since he came to America , he decided to have his family join him. They came by steerage in a boat called “California”. After three storm-swept weeks they finally arrived at Castle Garden (Battery Park, NY), the precursor to Ellis Island, where they were quarantined for several days. They were claimed by Chayeh’s brother, a noted Hebrew scholar known as the Krotinger Maven. They remained in New York City for a while, then went on to Fargo, while Ella, the oldest daughter, remained in New York. On arriving in Fargo, they were lodged with the Horowitz family until, a more permanent place could be found. David came home one day and announced he had bought a house, for which he paid the munificent sum of one hundred dollars. It was a two story frame house, located in a shabby neighborhood known as “Shantytown”, and in a very tough neighborhood where the words “Sheenie” and “Greenhorn” were common terms, spoken either in fun or intended as insults. Each year the Red River would overflow its banks, and the whole area would become flooded, Jim Kennedy, the contractor, used, sawed-off wooden blocks for paving Front Street, and these floated downstream. We used to tie our house with a stout rope to a nearby oak tree, but the rope broke and the house floated down the river until it struck South Bridge. As the flood subsided, the house turned upside down and so remained until it was towed back. Needless to say, it was a considerable time before the house became livable. How we learned to overcome the dankness without contracting pneumonia was truly a miracle. There were two outsiders living with us, one, notably, Moses Barron, who became a famous surgeon and served on the faculty of the University of Minnesota Medical School for forty years. He died recently at the age of 91. As the children grew older and entered school, they became ashamed of living in Shantytown, and urged their parents to move elsewhere if possible. Despite his frugality, David was unable on his meager salary to move into a desirable neighborhood, and the best he could do was to negotiate for a piece of property located on lower Front Street, owned, by the Kronick family. While it was somewhat of an improvement, it had its drawbacks. 74 Front Street was located flush with the sidewalk and it was difficult to gain privacy. Drunks coming from Moorhead would peer into the windows or rap on the door at all hours. But, despite the fact that it had no sanitary plumbing or electricity, it was livable. There was a nice back yard where some vegetables could be grown, I planted a young sapling, and as the years rolled by saw it grow into a giant elm tree. It was still there on my last visit to Fargo, but I doubt that it is still there. Chayeh took in a series of boarders, among then David Aronson, who married Ella. They had two children, a son named Aaron and a daughter named “Dora, Another boarder was Jacob Hershovitz who married Celia, and they had three children, two boys named Abe and Aaron and a daughter named Minnie. Bertha married Sam Paper, and she gave birth to ten children, eight boys named Joe, Alex, Nathan, Charles, Abo, Reuben, Lewis and Harry, and two daughters named Sarah and Minnie. 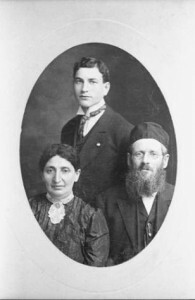 Each one is now married with children of their own, so it is evident that David and Chayeh Lesk are responsible for a substantial increase in the population of the Jews of North Dakota. About the year I907, an event occurred that had a profound effect on the Jewish community, the formation of the John Hay Lodge #630 of B’nai B’rith. While the membership, including out-of-towners, was small, it brought together Russian and German Jews in a common cause. The state of Norway presented the Jews of Fargo with a statue of Henrik Wergeland, the man who first opened the gates of Norway to Jews. As president of B’nai B’rith at the time, on the occasion of the installation of the statue in Island Park, I made a speech accepting the statue on behalf of Jews everywhere, and an article appeared in the Fargo Forum. The Jewish population of the state was gradually increasing. The Hebrew Immigrants Aid Society (HIAS) set up a program whereby they provided lists of trades people available for jobs, so if there was an opening for a tailor, mechanic, baker etc., it could readily be filled through this channel. A committee was organized, of which I was s secretary, to work with HIAS, and a number of families reached Fargo through this medium. As the Jewish community grew, so did its desire for betterment. 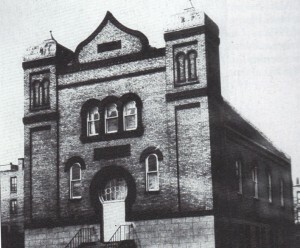 Up to now, services had been held in the back of a store but through the efforts of a number of dedicated individuals, they helped erect a suitable building which was incorporated under the name of Fargo Hebrew Congregation, with David Lesk as its Rabbi. Each year, David and Chayeh would handle the providing of the matzos for their community. They would take the orders, arrange the shipment and then the distribution, and finally get paid. It entailed a lot of work and little profit. As they advanced in years, I wanted to relieve them of the effort, but without avail. It was part of their life, and they refused to give it up. Likewise, I offered, to provide Chayeh with a maid, or better yet with, an apartment where they could enjoy modern conveniences, but she wouldn’t listen to it. Time wrought changes. The children grew into maturity, became dissatisfied with orthodoxy and wanted more reform, with the result that membership in the Congregation fell off. This naturally affected David’s income which at best had not been too good. However, in his declining years he had no financial difficulties as the monthly check they received from me was more than enough to take care of their daily needs, and even permitted them to accumulate some savings. David was very frugal and when he passed away he owned some property besides having money in the bank. He moved out of his house on 74 Front Street and purchased a small house on First Avenue South. Their 51st wedding anniversary was a gala affair, attended by the entire clan. Mrs. Lesk and I came from New York. Surrounded by her children and numerous grandchildren, never was a blushing bride happier than Chayeh I also attended their 6oth anniversary, I made it a point to visit them twice a year, but the occasion I enjoyed most was the Seder or Passover. It was given at the home of Mr. and Mrs. Sam Paper, and with their ten children seated around the table, their faces aglow with expectation, it was a sight worth remembering. The ritual was followed to the letter, opening the door for the angel Elijah to enter, the hiding of the matzos or Afikonim, and above all, the asking of the “di fir kashes” (the 4 questions) by the oldest child, followed by a sumptuous dinner and the singing of the psalms. David and Chayeh lived happily together for more than sixty years. His health started to fail first, and be became bed-ridden, Chayeh was the first to pass away (March 13, 1931), and when this occurred, it seemed as if something within him snapped, and he too died soon after (April 21, 1931).